The convention season is here! 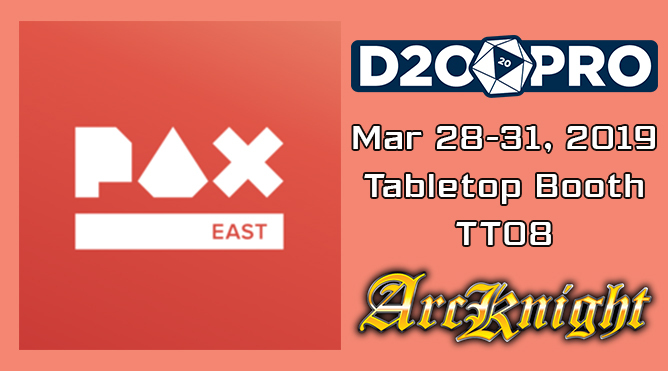 D20PRO is partnering up with ArcKnight, creators of fine-quality creature tokens, maps, and tiles at PAX East 2019 in Boston, MA. If you’re at the convention, swing by the Tabletop Gaming area, Booth TT08, to see the latest D20PRO features, get a demo, and talk to Mesa Mundi’s owner and Lead Developer, Tobias Drewry (Owlbear)! Not at the show? Pick up some fantastic ArcKnight products inside the D20PRO Marketplace for your own campaigns. PAX East 2019 runs from March 28th – 31st. You can buy and download products directly from the D20PRO software. Click on the Marketplace link in the main D20PRO menu, then click Launch Marketplace [step-by-step instructions]. D20PRO automates the complex elements of RPG gameplay – while preserving full GM control – so groups can focus on the roleplaying experience. Download our free 30-day trial to see how D20PRO can level up your next campaign. Eric Cagle serves as Mesa Mundi's Project Manager (a.k.a. : "Black Ops"). He's a tabletop industry veteran that helped to write and shape many of the RPGs you're playing today. He lives in sunny Seattle where it never, ever rains. D20PRO automates the complex elements of RPG gameplay (while preserving full GM control) so your group can focus on the roleplaying experience. Sign-up for the Newsletter to get all things D20PRO. Don't worry, we won't send you spam or junk, just VTT goodness.